Scott Van Pelt is a decorated American media anchor and sportscaster popular for being the host of a few sports talk shows. He has worked as the co-anchor for the 11 p.m edition of SportsCenter on ESPN as well as a host to various golf events for the television network. Van Pelt is a prominent personality for ESPN Radio where he manned his own three-hour program titled The Scott Van Pelt Show (2009) until the show was renamed SVP & Russillo in 2012. He left the radio show in 2015 to become a solo anchor to join the midnight edition of SportsCenter. The sportscaster was born in Brookeville, Maryland on July 7, 1966, to parents – Cathie Mathis and Sam Van Pelt, along with three brothers Mark, Matt, and Mike. Growing up in Washington, D.C area, Van Pelt attended Flower Valley Elementary School in Rockville but graduated from Sherwood High School in Sandy Spring, Maryland. He went on to study radio/television and film at the University of Maryland where he graduated in 1988 and is a member of the Pi Kappa Alpha fraternity. Van Pelt began his sports hosting career in 1990 at WTTG-TV, a FOX affiliate in Washington, D.C. Three years later, he joined the Golf Channel where he hosted some of the network’s signature programs, between 1994 and 2000. In 2001, he started working with ESPN as the presenter for the SportsCenter. His expertise in the field made him one the network’s top correspondents for golf and he also gained exposure, covering major tournaments including the Master Tournament. The acquisition of cable rights to the Open Championship granted him a pass to cover the golf tournament for ESPN. On ESPN Radio, he and Mike Tirico hosted the Tirico and Van Pelt show for a few years before it got canceled and replaced with The Scott Van Pelt Show in 2009. Besides the SVP & Russillo show, as it was renamed in 2012, Van Pelt started working for the ESPN Network as the studio presenter for the Friday night College Football on the network’s college football games. His other commendable work as a successful media anchor include being a commentator in golf video games on Tiger Woods PGA Tour 10 and Tiger Woods PGA Tour 11 on EA Sports. He has also appeared in a comedic turn in Aqua Teen Hunger Force Zombie Ninja Pro-Am. His decision to stay with ESPN came in 2012 and by late summer 2015, the network promoted him to be a solo anchor for a midnight edition of SportsCenter which covers sports events with the inclusion of commentary from the host and some popular elements from the radio show. Over the years in his career as a TV personality, it’s not surprising that Van Pelt has accumulated an estimated net worth of $16 million as of 2018. For all we know, he is among the highest-paid media personalities with a reported annual salary of $4 million. At a towering height of 6 feet 5 inches (1.98m), there is no doubt that Van Pelt stands above the average height of a typical American man and he also looks athletic and fit for his career as a sportscaster. At age 52, as of 2018, the father of two is still aiming high and may not be retiring anytime soon. Van Pelt is known to be married and as much as he is notably successful as a television presenter with over 1.9 million fans on Twitter, his family life is not always an open subject. However, he has shared pictures of his daughter, Lila Catherine and son Sam Van Pelt, as well as their dog, Otis on social media. 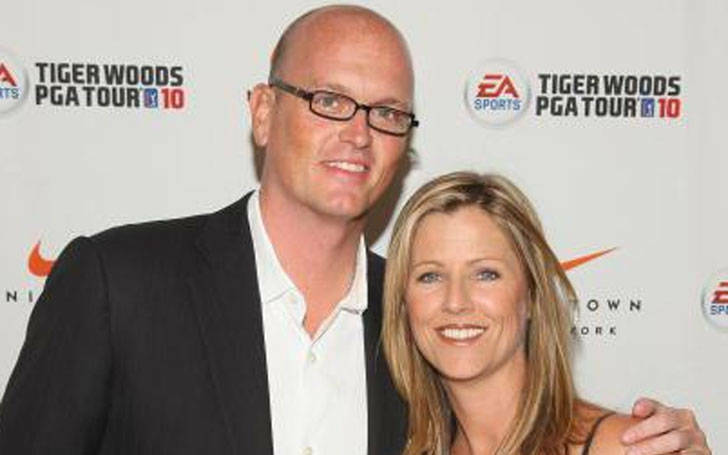 Scott Van Pelt and his wife, Stephanie Van Pelt got married in 2011 and had their children: daughter in 2012 and son in 2017. The couple enjoys a happy life at their home in Connecticut. Stephanie graduated from the University of Saint Joseph with a K-6 teaching certificate and is currently a teacher at Hinds County Schools in Jackson, Mississipi. She enjoys being a homemaker and spends a lot of time planning and decorating for each new activity.